I’ve always been fascinated by communication – all kinds of communication. What I’ve learned is, it’s not always just about transferring information. It’s also about, well, engaging people, making a connection, and drawing them in so they stick around long enough to consider what you have to say. That’s especially an issue in these days of information and media overload. How do even good companies with good products manage to break through all the noise? To answer this question, I began an experiment. I started observing myself absorbing media – all kinds of media. When I landed on a website, I carefully noticed where my eye went, what drew me in, what I clicked, what I ignored, and what impressions I was left with. I learned to find that one thing that helped a company stand out from its competitors. I learned to understand the real-world needs of buyers, both spoken and unspoken, and present the company’s solutions in those terms. And I learned to present web content in a way that quickly grabbed attention of even those with short attention spans (everyone, these days). And most of all, I learned that the superficial, worn-out marketing phrases on so many websites out there simply don’t work anymore. If a meaningful connection isn’t made, then opportunity is lost. Then as a copywriter, I started applying what I had learned from all that observing. Whenever I worked on a seller’s website, I mentally put on my buyer’s hat. At the end of the project, a good number of my business clients told me they now had a wider perspective of their company’s strengths, and what they themselves had to offer. 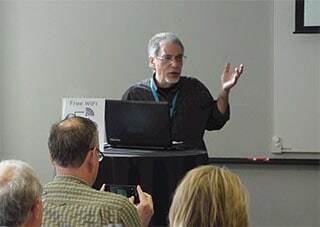 I also began sharing those insights in the classes and conference talks I’ve given to designers, writers, and other marketing and business professionals. I’m as fascinated by communication as ever. And I’m grateful for the chance to help sellers find their voice, and buyers find their perfect solution. 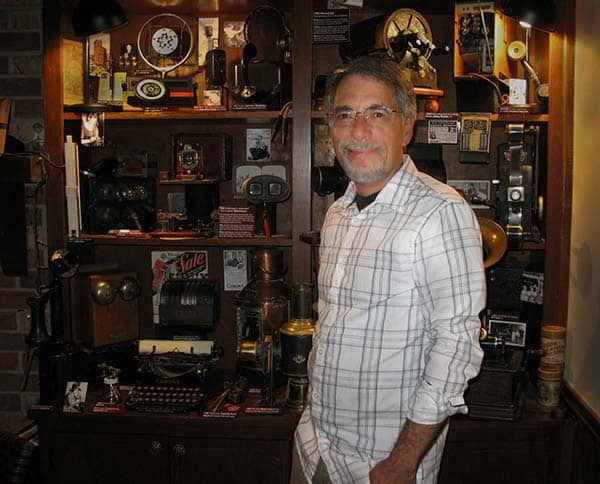 Here I am with my collection of ‘technology artifacts’ – media and communications devices from the late 1800s and early 1900s. Search Engine Optimization can help your website get noticed, but naturally search engines don’t make purchase decisions; humans do. By exploring how to appeal to the eye, the mind and the heart, we can utilize what we know about targeted buyers to draw their attention, make an engaging connection, and overcome any resistance. When a visitor lands on your website, the first thing they notice are the images. Are they strong compelling visuals that draw buyers closer; or are they … just o.k.? This session looks at a slew of before-and-after examples that clarify what we can do to improve the visual appeal and visceral impact of pictures on the web. The visual design of a website is only half the job. The other half is the writing, which can attract and and convert visitors if it’s done correctly — or push them away if it’s not. Learn why good marketing copy is just as much about the customer as it is about the company. Not a writer? Get tips for working with pro copywriters. With the glut of information and competitors online, how will you engage busy buyers with short attention spans? Two ways: by using design to draw folks into the key messages on your site; and by crafting those messages to make a genuine connection. The trick is to approach things from the buyer’s perspective instead of the seller’s perspective.